From 1957 to 1979, Tony DeLorenzo served as Vice President of Communications for General Motors. This was a time where even the PR guys were car guys, as DeLorenzo saw success in SCCA racing, with a 1967 L88 Chevrolet Corvette. Later, he shared 22 consecutive wins in a pair of Owens-Corning Fiberglas-sponsored C3 L88s with his racing partner Jerry Thompson. Thomson and DeLorenzo went down as the most successful Corvette racing team in SCCA history. 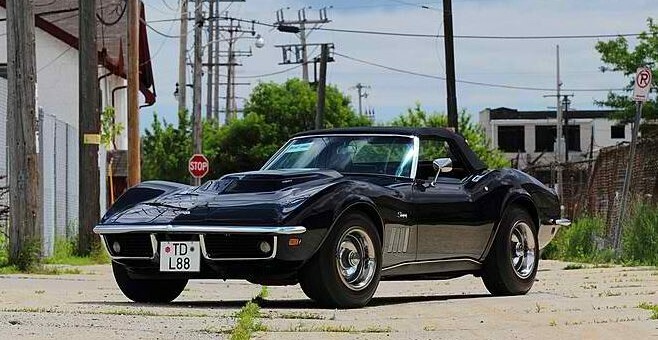 During that 22-win season, DeLorenzo special-ordered this triple black 1969 L88 Corvette Convertible from his racing sponsor, Hanley Dawson Chevrolet, to use as a daily driver — which was about as impractical as wearing ice skates in the summer. Why? Because the L88 Corvettes featured no HVAC, no radio, no power accessories, no fan shroud (which lead to overheating), a need for race fuel, and it was hella expensive for its time. The L88 RPO code added $1,032.15 to the Corvette Convertible’s $4,438 MSRP. But DeLorenzo ain’t care, because car guy. According to Mecum, DeLorenzo dressed up his L88 to match his Owens-Corning-sponsored racer, adding chromed Kustom exhaust headers and side pipes, FIA-spec Plexiglas-covered headlight assemblies, fender flares and a urethane bumper. Then, in December 1969 DeLorenzo sold the car to his friend Curt Wetzel, a German Pan Am Airlines pilot. Wetzel then proceeded to race the car throughout Europe, beating pretty much everyone, and irked enough people to the point where Porsche bought the car to keep it off the track. But eventually, the L88 drop-top returned to the road course under the ownership of Hans Hirt of Switzerland. Hirt owned the car for twelve years before selling it to Joe DeMesy of Dallas, Texas, who in 2003 delivered it to Naber Brothers in Houston for a frame-off restoration. Pay attention between September 3-6 for the Mecum Dallas auction, because this Corvette racer is sure to fetch a pretty fine price. My Dad was too busy doing GM PR to do all the racing. He left that up to me.